Galway Bay features a fully stocked bar, a family dining area, a comfortable tasting room, a banquet hall, a game and sports room plus an outdoor covered garden area! We strive to be one of Ocean Shores’ finest dining experiences, with a wonderful staff, friendly servers, top notch chefs and well experienced mixologists, you will be sure to receive a premier dining experience. We have a well stocked game room with a pool table, darts, a shuffleboard, and televisions and seating for all your sports and entertainment needs! Out back we have a beautiful covered outdoor garden area for a more intimate setting, complete with heat lanterns, televisions and a stage. Our gift shop has a huge collection of unique imported Irish and Celtic items for purchase. We have a large banquet room available for reservation for events & private parties. Check out our tasting room for relaxing with friends in a more home-like setting. Blue cheese, Dubliner White Cheddar from Co. Tipperary and Wensleydale from North Yorkshire, England paired with candied walnuts, fresh grapes and soda bread. A Perfect Beginning. 1lb. 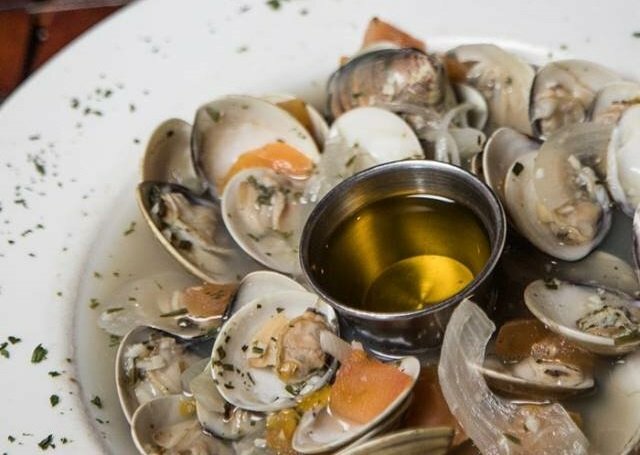 of clams, steamed in a white wine with fresh tomatoes, onion and garlic, served with drawn butter. Traditional Hummus served with fresh vegetables and pita bread. All of our steaks are seasoned and charbroiled to your temperature. Served with colcannon, soup or salad, and soda bread. Chef Alex suggests a full bodied red wine with all steaks. 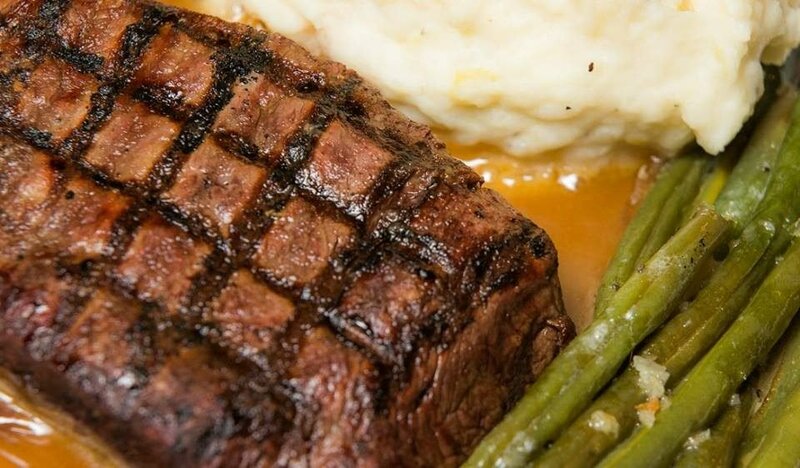 Minced garlic and flamed irish whiskey add a grand flavor to our 10oz Certified Angus Beef flat iron steak. Served with seasoned vegetables. If it doesn't look good to us, you'll never catch a glimpse of it! Lightly seasoned, and char broiled until delicious. Finished with herbed butter and served with seasoned vegetables. A 14oz. rack marinated for 24 hours in our special seasoning blend, served over a rich red wine demi-glace. This is so-o-o good that Liam put his own name on it. If you're not as hungry, try our 7oz. Half Rack of Lamb. Served with colcannon, soup or salad, and soda bread. Chopped steak and lamb with sauteed carrots, green peas, onions, potatoes, garlic and herbs topped with Guinness gravy, and a savory layer of colcannon and pastry, then baked in the oven until piping hot. Pork sausage baked in a puff pastry and then covered with our tasty Guinness gravy. A Scottish dish invented by a Forfar baker in the 1850's. Beef and lamb slowly braised in white wine, flavored just right with sautéed onions, carrots, potatoes, garlic and herbs, then baked in a puff pastry and covered with our famous whiskey cream sauce. Get a Cigar for enjoying at the Smoking Paddy O’! Served with colcannon (except the Seafood Fettuccine), soup or salad, and soda bread. Chef Alex recommends a semi-dry white wine with all seafood selections such as a Chardonnay or Pinot Gris. Steamer clams and black tiger prawns sautéed in white wine, then blended in a creamy garlic parmesan sauce. Served over fettuccine, with garlic bread on the side. Tender chunks of shrimp and seasonal fish, baked in a puff pastry shell with fresh sautéed mushrooms, onions, carrots, bell peppers, asparagus, garlic, and herbs. Served over our famous whiskey cream sauce. Oysters have been harvested for consumption by generations of Irish. The oysters from Galway Bay have long had a reputation for excellence. Our locally sourced oysters are lightly breaded and seasoned, pan fried and served with a house made cocktail sauce. Certified Angus Beef@ A juicy. 6 oz. hand-formed seasoned patty charbroiled and topped with Swiss cheese and placed on a warm bun. Just like the Irish do. Our own 5 oz. tender lean brisket sliced thin, piled high, topped with Swiss cheese and put on a freshly baked soda bread with a pickle spear and a side of ground horseradish! Two pieces of Alaskan Cod, cooked to perfection in our own Galway Bay Irish Ale beer batter, served with housemade tartar sauce and fries. Served with fresh baked soda bread slices & butter. Thick, steamy and fresh. Made daily in our kitchen. Yes, this is the chowder you've heard so much about. Argued to be the best in the Pacific Northwest and proven to be the best on the North Beach! For the lover of Guinness stout! Tender chunks of beef are joined with carrots, potatoes, onions and mushrooms and slow cooked for hours in Guinness stout. A hearty Irish stew of sausage, bacon, potato, onion and carrots. We have an intimate tasting room for your enjoyment. Our Pizzas are served on a 12″ square flatbread crust and cut into 8 pieces. Okay we had to name something after him! This one has the works: Pepperoni, Sausage, Canadian Bacon, Green Peppers, Tomatoes, Black Olives, Onions, Mushrooms, and Mined Garlic. Alfredo sauce, mozzarella cheese, fresh tomatoes, chicken finished with scallions. Our Game Room is Complete with Shuffle Board, a Pool Table, Darts, Televisions & More! Served with toasted soda bread and fresh fruit. Our own handmade hash comes with two eggs any style. Three slices of our very own egg battered soda bread pan fried and served with syrup. Three eggs with corned beef and cheese, along with our irish potatoes. Two fried eggs over hard, topped with rashers and swiss and placed atop a fresh baked bun. Served with baby red potatoes, lettuce, tomato, onion and pickle on the side. 6oz top sirloin, two eggs any style alongside irish potatoes. This is exactly how you would get it in Ireland. Two eggs any style, two rashers, one banger, one black pudding, one white pudding, baked beans, and fried tomatoes. Galway Bay Irish Pub offers the largest selection of Scotches and whiskies in the area! Ask about our collection of spirits, wines and beers! One of our expert mixologists will create you a unique cocktail concoction that will delight your senses! Bushmills Irish Whiskey infused with espresso beans. Mixed and served over ice with simple syrup and half and half topped with house made whipped cream to garnish. Silver rum infused with mangos, papayas, kiwis, pineapples and cherries. Mixed with pineapple juice, orange juice, a few splashes of soda water and a drizzle of grenadine. Served over ice in a pint glass with a slice of lemon, lime, blood orange and topped with cherries. Boru Irish Vodka infused with lemons, limes, strawberries, raspberries and blueberries. Mixed with muddled lemons, simple syrup, and a splash of soda water. Served in a sugar rimmed martini glass with a fresh slice of lemon. 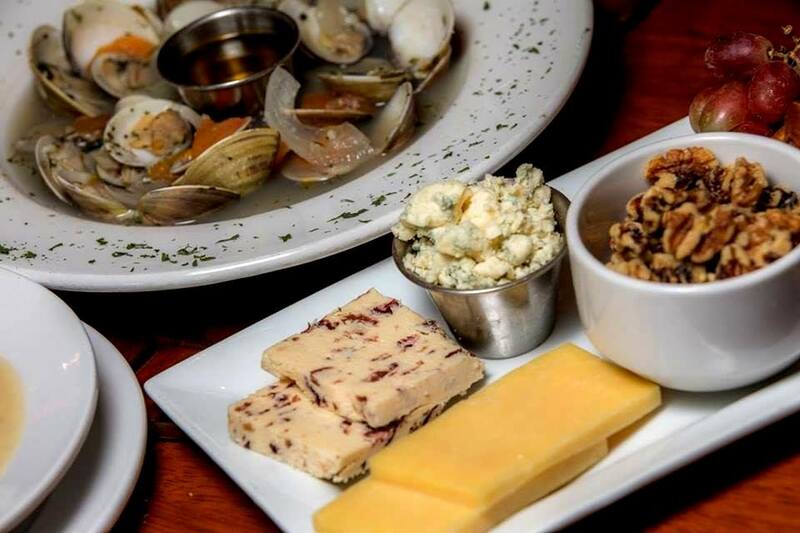 Galway Bay Irish Pub offers a Family Friendly Dining Area!